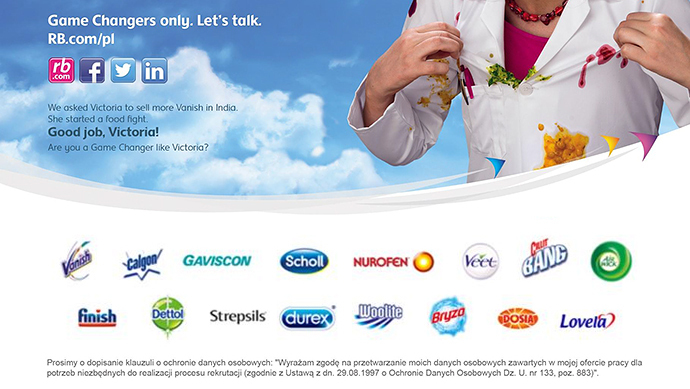 RB is the world's leading consumer health and hygiene company. We work with the best people to challenge conventional thinking and keep giving people innovative solutions for healthier lives and happier homes. RB Hygiene Home division is a wide portfolio of well-known brands like Finish, Vanish, Air Wick, Cillit Bang, Calgon, Bryza, Dosia, Lovela and Woolite. It’s time to tackle new challenges. Take calculated risks. Make daring decisions. Be assertive. Be brave. Be bold. Then ask for more.